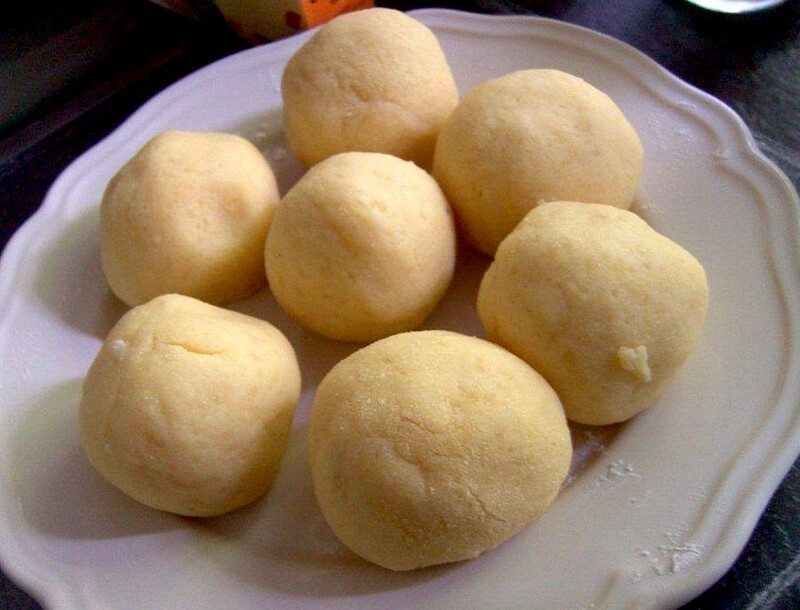 Are you looking for an easy to make potato dumpling recipe? Here you are - You found the right page for such a recipe. These dumplings taste like the ones that your mom or grandma used to make. Of course serve them with a home made gravy, that's mandatory! They taste great with a roast, beef rolls, goulash or stew. And what are the best potatoes for dumplings? Try out this recipe. Happy Cooking! Boil potatoes. You can peel them and cut in quarters or boil with the skin but then you need to peel them while they are hot. Squeeze potatoes through a potato press (they must be hot). You also can use a potato masher. Potatoes must be mushy. Let cool off until they are warm. Add eggs, flour, starch and salt/pepper to taste. The potato dough should be slightly moist. If you are uncertain do a test and cook one dumpling. With moist hands form dumplings of a tennis ball size. Bring water with some salt to a boil, reduce heat a bit so that the water is slightly boiling. Place the dumplings into the water for about 10 min. When the dumplings swim at the surface have them in the water for another 5 min. Remove them with a slotted spoon and serve right away with your favorite meat and gravy dish such as beef rolls, goulash or beef roast. You can add herbs or fill them with cheese, fried mushrooms or roasted onions.